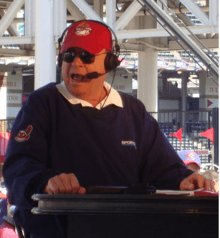 Longtime "Voice of the Tribe" Tom Hamilton - who has been calling Indians games on the radio since 1990. 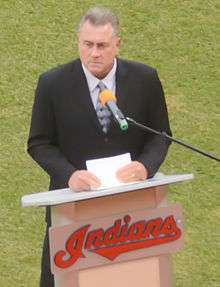 Rick Manning - who has served as the Indians TV color analyst since 1990. 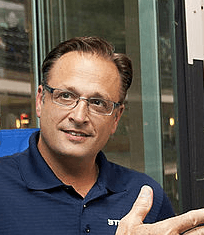 Matt Underwood - who has been a member of the Indians broadcast team since 2000. The Cleveland Indians are currently heard on the radio on flagship stations WTAM 1100 AM and WMMS 100.7. Tom Hamilton and Jim Rosenhaus comprise the announcing. Durring the postseason SportsTime Ohio (STO) field reporter Andre Knott joins the radio broadcast as the in game reporter. 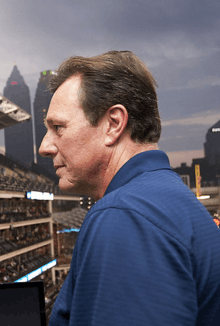 On the television side, the games air on the Fox Sports owned SportsTime Ohio (STO), with select games simulcast on WKYC channel 3 in Cleveland (NBC). Matt Underwood handles play-by-play duties with former Indian Rick Manning as analyst, and Andre Knott as field reporter. Years are listed in descending order. 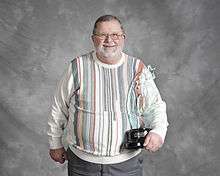 ¹: WJW-AM became WRMR in 1985, and was vacated for WKNR in 2001. The majority of games in the 1948 and 1949 season were covered on its FM sister station, WJW-FM, due to the AM station's programming commitments with ABC Radio. Due to this, a statewide radio network was soon established, and more FM radio sets sold in Cleveland than in any other market in the country in 1948. WJW-FM became WCJW in 1965, and WQAL in 1972. ²: WXEL-TV became WJW-TV in 1955, WJKW in 1977, and back to WJW in 1985. ³: WGAR became WKNR in 1990; currently home to WHKW. *: Select home games were only covered by WTAM from 1929 to 1931, as Tom Manning also served as a field announcer at League Park. **: Jack Graney replaced Ellis Vander Pyl as play-by-play voice for WHK several games into the 1932 season. ***: Four radio stations simultaneously covered the June 28, 1946 Indians game, which occurred shortly after the purchase of the team by Bill Veeck. Permanent play-by-play was established at that point, with the games going to WGAR. WWWE later became WTAM, when the station returned to their original call letters in 1996 (WTAM 1923-1956; KYW 1956-1965; WKYC 1965-1972; WWWE 1972-1996; WTAM 1996–Present). WERE switched frequencies with current sister station WJMO on June 3, 2007.